ENO Underbelly Gear Sling. Reach your gear whenever, wherever. 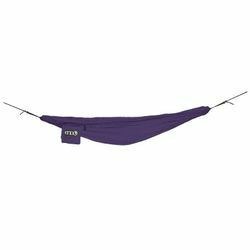 We've all seen it: your gear is jealous of you swaying in your hammock and decides to punish you by staying just out of arm's reach. The ENO Underbelly is the perfect solution. Hanging just below your hammock, the Underbelly keeps your gear out of the dirt and easily within reach. Everyone's happy. Eagles Nest Outfitters. Unfolded dimensions:	(L x W) 54" x 54"